Harry Potter and Parks and Recreation are two fandoms that have entered the pop culture lexicon. Whether you love one, the other, or both of them, there's no arguing that they're certainly legendary. However, have you ever considered combining the two? 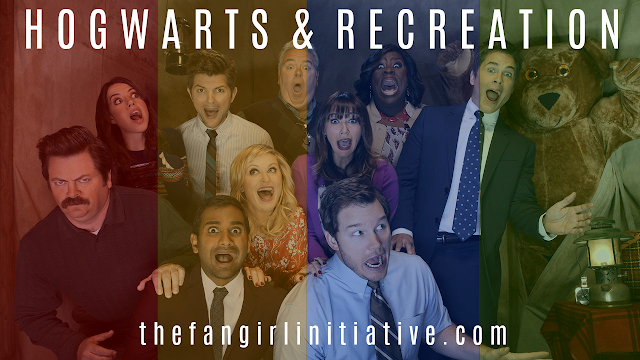 Parks and Rec certainly did—it's filled with references to our favorite wizarding world. And it certainly would have been amusing (and rather time-bending) if J.K. Rowling had done likewise. However, what would happen if our favorite government employees had attended Hogwarts? What classes would they have taken? What alliances and friendships would have been formed? Would we have our own Golden Trio—and who would it be? And most importantly, what Hogwarts Houses would they have been sorted in? Never fear! I'm here to answer that question once and for all! Hold onto your broomsticks! I found a reason to sort Leslie into every single house. She's as fearless as a Gryffindor, she seeks out knowledge like a Ravenclaw, and she has the drive and ambition of a Slytherin. However, Leslie's loyalty to her friends and her dedicated worth ethic often win out: she could easily be a Hufflepuff. Hard work is a key Hufflepuff trait, which I think we can all agree applies to Leslie. Her golden, pure heart and kindness are also major factors here. Ultimately, though, it boils down to her loyalty—her loyalty to her family, her friends, and the people of Pawnee. Leslie's unwavering dedication to the causes and people closest to her heart lands her in the most loyal house of them all. On the other hand, though, Leslie is brave and unflinching like a Gryffindor. She doesn't back down (a trait that goes hand in hand with her Hufflepuff loyalty). She fights hard for what she believes in, and she jumps headfirst into any sort of fight that should arise for her causes. Like I said, a case could be made for her to fit in any of the other houses. If she persuaded the sorting hat, Leslie could be in any house she chooses. For my purposes, however, I think Leslie would be a Hufflepuff with the bravery and nerve of a Gryffindor. Just call her a Gryffinpuff. I didn't want to be cliche with this one, but I couldn't escape the fact that April is a classic Slytherin. She's resourceful, calculated, and clever. Though she says often that she wants to do "nothing with no one," which would imply a lack of ambition, if you look a little closer you'll see that April does have a drive. It's just drive to do the things that she wants to do rather than the things that she's forced to do. She's often out for her own interests, though that's by no means always a bad thing. She's also brave and forthcoming, but not in the reckless, Gryffindor way. Plus, she would really fit in well in the dungeons at Hogwarts. Scratch that—she'd frickin' love it. 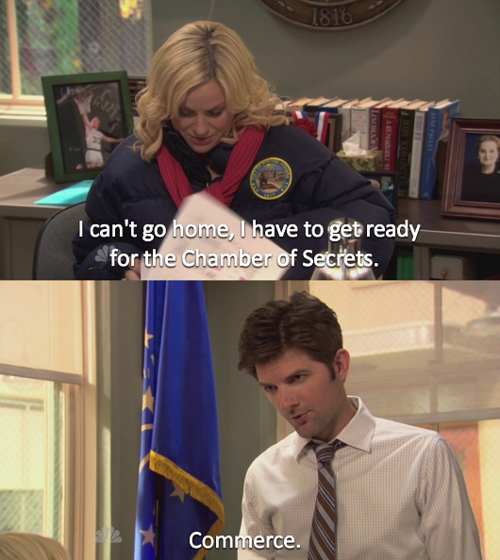 I'm confident with all my heart and soul: Ben Wyatt is a Ravenclaw. While he may be more of a Batman and Game of Thrones kind of guy than a Harry Potter one, he's still 100% nerd. And I love him for it. He thrives on facts, statistics, and knowledge. They're his lifeblood. He's faces a problem from the analytical side before anything else, preferring to sit back rationally before plunging head-on into a problem. For that reason, he balances out Leslie's impulsive side perfectly. However, the biggest reason I'm placing him in Ravenclaw is not only his sheer love for facts of all kinds, but his determination to tell you all about those facts. He's a nerd, and he's an adorable one. Ann was one of the hardest characters for me to sort, but ultimately I settled on Hufflepuff with Ravenclaw tendencies. Hufflepuff because of her devotion to her friends, and Ravenclaw because of her critical thinking skills and reliance on analysis. Ultimately though, Ann's dedication to her friends and her work puts Hufflepuff at the top. Though Ann was a bit enigmatic, my personal opinion is that her closest House would be Hufflepuff (or Ravenpuff). Chris is friendly, devoted, and hard-working, all classic traits of a Hufflepuff. (It doesn't hurt that he's literally the nicest person you will ever meet.) I honestly don't see how he could be any other house. He'd be the one helping you stay up late to study spells or offering you chocolate frogs on the Hogwarts Express. If you need a good friend, look for Chris Traeger, your resident Pawnee Hufflepuff. Donna is another person who could easily be sorted into several different houses. At first, I thought she was a Gryffindor who could also be a Ravenclaw (much like Hermione Granger). She values wisdom and information, as evidenced by her wealth of knowledge on all kinds of things (but especially pop culture). Her penchant for live tweeting things seems like a very Ravenclaw thing to do. Her bold way of living out loud and encouraging others to do the same point to a very Gryffindor heart. However, a friend pointed out to me that Donna was a Slytherin, and it was like a fog had lifted. Of course! Donna embodies all the classic traits: cunning, wit, ambition, determination. In many ways, she could be a textbook Slytherin. However, sometimes she embodies these classic Slytherin traits in unconventional ways. For example, she often manipulates circumstances to get what she wants, but she also manipulates circumstances to help other people. Donna marches to the beat of her own drum, even when it comes to her Hogwarts House, and I think that's just the way it should be. With her Gryffindor bravery and Slytherin cunning combined, it wouldn't be inaccurate to call Donna a Slytherdor. However, for the sake of simplicity—and because she literally is one—I think we can all agree that Donna belongs in Slytherin. This comes from canon itself, in which Garry says something helpful and Leslie says, "Ten points for Hufflepuff." However, beyond being canon, it's true. Garry cares deeply for his friends (despite their initial lack of care for him) as well as his family. And although it's often because he has to correct his own screw-ups, he's extremely dedicated to his job, something that's proven time and time again throughout the show (licking millions of envelopes, anyone?). Though not a part of the main cast nor a government employee, Jean-Ralphio Saperstein is certainly a fan favorite. And though he was certainly hard to sort (I had to consult with several others for advice), he would probably be a Slytherin. Much like his buddy Tom, Jean-Ralphio has high-reaching dreams. Though sometimes he has trouble attaining them, he certainly has the boldness and the determination for it. His cunning and wit would definitely help him fit in down in the dungeons. He would look damn good in the Slytherin colors. And let's face it—he would definitely get a kick out of famous Slytherin Draco Malfoy. What do you think of these Sorting results? Agree? Disagree? Let's discuss! Many thanks to Amanda, H. Grace, and Jaime for giving feedback on my sorting choices.